The Ultimate Source Book of Postdigital Portraiture for Character Designers, Connoisseurs and the Creatively Curious. In our postdigital culture, fantasy and imagination take a back seat to the photographic spectacle. As a visual antidote to the current craze for saccharine pet pictures and selfies ad nauseam, international illustrators, graphic designers and artists confront us with a stunning new generation of imaginary character portraits that hold us in the grip of their gaze. 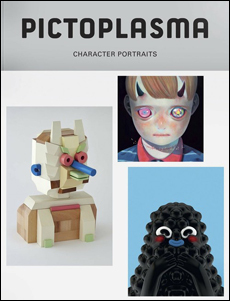 This spanking new Pictoplasma compilation presents character portraits by an international scene of artists, designers and fresh talent. It follows in the footsteps of the long sold-out Character Encyclopaedia (2006) and Character Compendium (2012). Featuring more than 600 outstanding artworks and individual character studies by 200 international artists, the compilation showcases work by Aryz, Bakea, Brosmind, Bubi Au Yeung, Charles Huettner, Hikari Shimoda, Low Bros, Maniackers Design, Max Gärtner, Ori Toor, Sue Doeksen, T Wei, Ted Parker, Yomsnil… and many, many more.